Married Name Her married name was Hennings. Unknown (?) married Henry Hennings. Married Name Her married name was (?) Eckstein. (?) Hennings was the daughter of Henry Hennings and unknown (?). (?) Hennings married F. C. Eckstein. F. C. Eckstein married (?) Hennings, daughter of Henry Hennings and unknown (?). Married Name Her married name was (?) Gluth. (?) Hennings married Herman Gluth. Herman Gluth married (?) Hennings, daughter of Henry Hennings and unknown (?). Married Name Her married name was (?) Yeck. (?) Hennings married August Yeck. August Yeck married (?) Hennings, daughter of Henry Hennings and unknown (?). Married Name Her married name was Landingham. Esther Hennings was the daughter of Henry Hennings and unknown (?). Esther Hennings married (?) Landingham. (?) Landingham married Esther Hennings, daughter of Henry Hennings and unknown (?). (?) Landingham died before 1936. Married Name 4 June 1949 As of 4 June 1949,her married name was Ringelstetter. Kitty L. Runyan was born on 21 May 1927. She was the daughter of Sidney H. Runyan and Mildred V. Snyder. 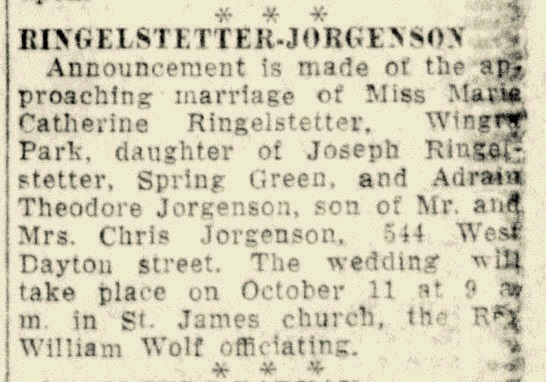 Kitty L. Runyan married Henry Joseph Ringelstetter, son of Joseph Ringelstetter and Margaret Kaul, on 4 June 1949. Kitty L. Runyan died on 21 December 2005 at age 78 Kitty L. Ringelstetter, age 78, of Spring Green, passed away unexpectedly on Wednesday, Dec. 21, 2005, at the Sauk Prairie Memorial Hospital. She was born on May 21, 1927, in Wyoming Valley, the daughter of Sidney and Mildred (Snyder) Runyan. She was married on June 4, 1949, to Henry J. "Hank" Ringelstetter. Kitty was a member of the Spring Green American Legion Auxiliary, Treasurer of the Spring Green Community Library, Spring Green Women's Golf League and was an Avon cosmetics representative for 25 years. She is survived by her son, Brian (Sarah) Ringelstetter of Spring Green; three grandchildren, Stacie (special friend, Andy), Ashley and Nicole Ringelstetter; a brother, Dean (Lorraine) Runyan of Spring Green; nieces and nephews; other relatives; and special friend, Sue Meise. She was preceded in death by her parents, Sidney and Mildred Runyan; her husband, Hank Ringelstetter on Oct. 19, 2001; and a sister, Bonita Hickox. Funeral services will be held on Saturday, Dec. 24, 2005, at 10 a.m. at the RICHARDSON-STAFFORD FUNERAL HOME, Spring Green, with the Rev. Herb Bowers officiating. Burial will be at the St. John's Catholic Cemetery in Spring Green. In lieu of flowers, memorials may be made to the Spring Green Community Library. Richardson-Stafford Funeral Home. She was buried after 21 December 2005 at Saint John the Evangelist Catholic Cemetery, Spring Green, Sauk, Wisconsin. Milo Detos Snyder married Anna Ringelstetter, daughter of Joseph Ringelstetter and Margaret Kaul. Milo Detos Snyder was born on 13 August 1896 at Spring Green, Sauk, Wisconsin. He was the son of George N. Snyder and Sophia Beaver. Milo Detos Snyder died in 1982. Enoch Olson was born in 1912. He married Clara Ringelstetter, daughter of Joseph Ringelstetter and Margaret Kaul, on 1 February 1936. Enoch Olson died in 1969. Name Variation Adrian Theodore Jorgenson was also known as Adrain Theodore. Adrian Theodore Jorgenson was born on 3 March 1904 at Wisconsin. 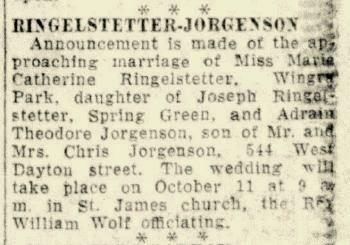 He married Marie Catherine Ringelstetter, daughter of Joseph Ringelstetter and Margaret Kaul, on 11 October 1930 at Wisconsin Marie Catherine Ringelstetter and Adrain Theodore Jorgenson engagement announcement. Adrian Theodore Jorgenson died on 30 November 1969 at Wisconsin at age 65. Fred Roewer was born circa 1862 at Germany. Married Name Her married name was Roewer. Eliza (?) married Fred Roewer. She was born circa 1869 at Wisconsin. Edward Roewer was born circa 1892 at Wisconsin. He was the son of Fred Roewer and Eliza (?). Edward Roewer died after 1971. Paul E. Roewer was born circa 1899. Paul E. Roewer married Edna E. Niemann, daughter of Henry George Niemann and Emma Dorothea Steckelberg, between 1928 and 1954. Paul E. Roewer died in January 1972 Funeral services for Paul E. Roewer, 73, who died unexpectedly Wednesday after suffering an apparent heart attack at home, will be held here Saturday. He was owner and operator of the Roewer Store from 1951 until 1967, when he retired. He was born in Westfield Township and was a lifelong area resident. Mr. Roewer was a member of St. John's Lutheran Church here, served on its Board of Elders, was treasurer of its Cemetery Board and was a member if its Men's Club. Surviving are his wife, the former Edna Neiman; a son, William, Oak Creek; a brother, Edward, Reedsburg; a sister, Mrs. Louie Harms, Loganville; and two grandchildren. The funeral will be at 1:30 p.m. Saturday in the church. Friends may call after 3 p.m. today at the Gant Funeral Home, Reedsburg. Taken from the Reedsburg Times Press of January 12, 1972. On 27 July 1928 Mr. and Mrs. Allen Nieman entertained Miss Edna Nieman, Hilda Gall, Paul Roewer and Lorenz Baumgarten at a dinner party Friday. Name Variation William H. Roewer was also known as Bill. William H. Roewer was born on 12 April 1934. He was the son of Paul E. Roewer and Edna E. Niemann. William H. Roewer died on 7 March 2015 at age 80. Martin Roewer was born circa 1894 at Wisconsin. Martin Roewer died before 1972. Oscar Krueger was born on 4 October 1898. He married Leona L. Schenck, daughter of Henry J. Schenck and Ida M. Radtke, on 25 December 1925. Oscar Krueger died on 15 June 1996 at age 97. Harold Erwin Kaun married Selma L. Schenck, daughter of Henry J. Schenck and Ida M. Radtke. Harold Erwin Kaun was born on 25 November 1913 at Wisconsin. Harold Erwin Kaun died on 3 August 2006 at age 92 Harold E. Kaun, age 92, of Reedsburg, died on Thursday, Aug. 3, 2006, in the Reedsburg Area Senior Life Center. Survivors include his wife, Selma; three children, David (Kathy) Kaun of Hudson, Karen (Victor) Hineman of Lime Ridge and Donald Kaun and his special friend, Heidi Addison, of Stitzer; nine grandchildren; three brothers, Alvin (Jessica) Kaun of Janesville, Robert (Arlee) Kaun of Reedsburg and Richard (Louise) Kaun of Loganville; three sisters, Dorothy Derringer of Janesville, Arlene Peterson of Tacoma, Wash. and Leona (Evan) Jones of Janesville; many nieces and nephews; and other relatives and friends. He was preceded in death by his parents and three brothers, Edmund, Paul and Alfred. Funeral services will be conducted at 1:30 p.m. on Sunday, Aug. 6, 2006, at ST. JOHN EVANGELICAL LUTHERAN CHURCH, Reedsburg, with Pastor Christopher Miller officiating. Interment will be in Greenwood Cemetery with military rites provided by the Reedsburg V.F.W. Post 1916. The family will receive friends from 3 p.m. until 6 p.m. on Saturday at the HOOF FUNERAL HOME in Reedsburg. In lieu of flowers, memorials to St. John Lutheran Church or the Reedsburg V.F.W. would be appreciated. He was buried after 3 August 2006 at Green Wood Cemetery, Reedsburg, Sauk, Wisconsin. Victor Rehr was born on 21 August 1925. He died on 23 March 2001 at age 75 Victor F Rehr, age 75, of Reedsburg, died unexpectedly on Friday evening, March 23, 2001 at the Meriter Hospital in Madison. He was born on August 21, 1925 in the Township of Freedom, Rock Springs, the son of Henry and Emma (Steinhorst) Rehr. Victor was united in marriage to Lily Schenck on July 21, 1950 . He was a member of the Board of the Reedsburg Area Historical Society, a member of the Reedsburg Senior Citizens, Senior Seranadors, a past member of the Board of Farmers State Bank in Rock Springs, and past President of the A.A.L. Branch 60. Victor farmed and worked at Flambeau Plastics in Baraboo until his retirement. Survivors include his wife, Lily, one son, Dennis (Melody) Rehr of Rock Springs; one daughter, Diane Rehr-Ritt of Reedsburg; three grandchildren, Jacob, Zoe and Courtney; one brother Henry (Connie) Rehr of Clayton, California; one nephew, James Markham of Flagstaff, Arizona; cousins; nieces and nephews; and other relatives and friends. He was preceded in death by his parents; one brother, Robert Rehr; one sister, Ruby Markham; a nephew, Henry Rehr Jr; one foster brother, John Linde and one foster sister, Eva Braun. Funeral services will be conducted at 11:00 a.m. on Tuesday, March 27, 2001 at the St. John's Lutheran Church in Rock Springs, Wisconsin with the Rev. Paul Schroeder officiating. Interment will be in the church cemetery. The family will receive friends from 4:00 p.m. until 8:00 p.m. on Monday at the Hoof Funeral Home in Reedsburg. Clarence Schenck married Phyllis (?). Clarence Schenck was born on 15 September 1921. He was the son of Henry J. Schenck and Ida M. Radtke. Clarence Schenck died on 1 April 2006 at age 84. Married Name Her married name was Schenck. Phyllis (?) married Clarence Schenck, son of Henry J. Schenck and Ida M. Radtke. Phyllis (?) died after 2002. He married Ellen F. Hirn. Edward M. Schneider was born circa 1893. Ellen F. Hirn married Edward M. Schneider. She was born circa 1898. Roger W. Schneider married Eunice (?). Roger W. Schneider was born circa 1921. He was the son of Edward M. Schneider and Ellen F. Hirn. Roger W. Schneider died on 4 December 2002 Roger W. Schneider, age 81, died on Wednesday, Dec. 4, 2002, at Reedsburg Area Medical Center due to complications following hip surgery. 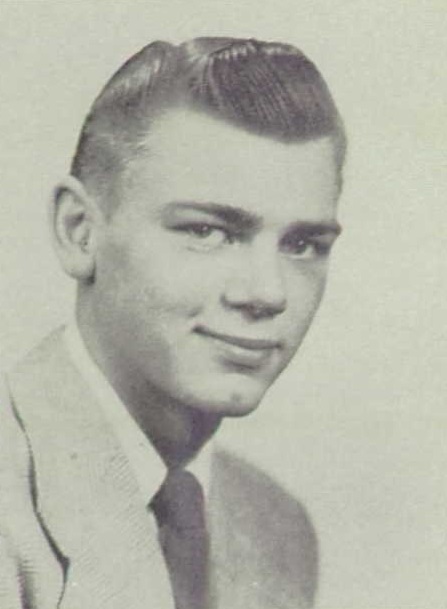 Survivors include his wife, Eunice; two daughters, Joan (Ray) Martin of Reedsburg, and Marcia (James M.) Montgomery of LaValle; three grandchildren, Jaye, Kyle and Leigh Ann Martin; a brother, Alfred (Barbara) Schneider of Columbus; three sisters, Wilma (James) Koenecke of Reedsburg, Mary Lou (Kenneth) Jicha of Antigo, and Audrey (Gene Sinner of Baraboo; two brothers-in-law, Julius (Adeline) Herritz and Lorenz (Elva) Struck, and a sister-in-law, Gertrude Schneider, all of Reedsburg; nieces and nephews; other relatives and friends. Funeral services will be conducted at 11 a.m. on Saturday, Dec. 7, 2002, at ST. PETER'S LUTHERAN CHURCH, Reedsburg, with the Rev. Kevin Kohnke officiating. Interment will be in Greenwood Cemetery. The family will receive friends from 5 p.m. until 8 p.m. on Friday, Dec. 6, 2002, at HOOF FUNERAL HOME, Reedsburg, and from 10 a.m. until the time of service on Saturday at the church. In lieu of flowers, memorials to St. Peter's Lutheran Church would be appreciated. Eunice (?) married Roger W. Schneider, son of Edward M. Schneider and Ellen F. Hirn. Married Name Her married name was Jicha. Mary Lou Schneider was born after 1930. She was the daughter of Edward M. Schneider and Ellen F. Hirn. Mary Lou Schneider died before 2016. Ewald K. Schneider was born in 1920. Ewald K. Schneider married Gertrude Struck on 18 June 1941. Ewald K. Schneider died on 1 October 1969.